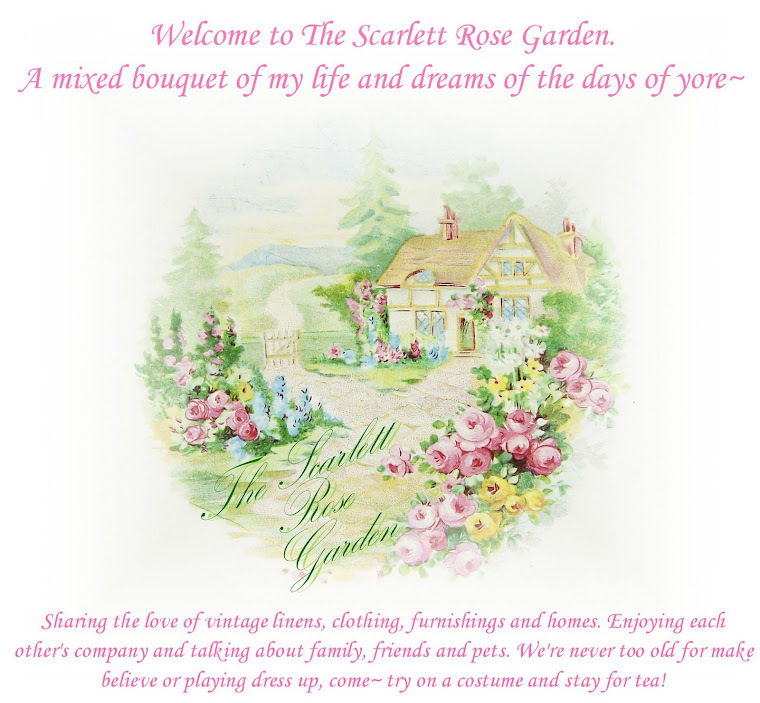 The Scarlett Rose Garden: If Walls Could Talk... 100th Post!!... Gift Give Away!!! If Walls Could Talk... 100th Post!!... Gift Give Away!!! (Please don't *skim* over this one, you might miss something!) And as always, click images to see larger versions if you like. I can't believe I've come this far. How fun it has been to meet all of you, and become part of each other's worlds. I have learned quite a bit in these last few months; about others AND myself. It has been a wonderful experience and I thank each an every one of you bloggin' buddies! When starting out, I wanted to lead you through each room of our 100 year old home as I gave you the "tour". However, I quickly found out that blogging takes you in many different directions and I haven't stayed on course! You can see the first few posts about our home at the end of May (link in sidebar archives)~ and throughout my blog if you check the labels. Today I'm going to take you upstairs and show you the front bedroom, or my craft room, as it was when we moved in. Here is the door leading into the room. The only room with a transom left upstairs. Perty, huh? It's also the only transom with working hardware. Curious cats! This brown stuff on the walls here is CORK!! Ugh. I kept thinking how horrendous it would be to remove, but we ended up gutting the entire room so it didn't matter, lol! You can see an outlet in the middle of the left wall, I guess where they plugged in a kitchen stove. We have two of them over there. So yes, funky wallpaper, cork, and incredibly bright aqua blue paint all in one room. Bamboozling isn't it? Since the closet had a window and I could tell it was not original to the house, possibly built in the 20's or 30's, I had Kevin take it out. It was still a somewhat hard decision! But I'm so glad we did it.... here's a shot afterwards~ nice and bright! By this point we had torn into the living room and dining room and found a few old bottles in the debris. So when he started on the closet removal, I told him I hope he finds something cool there too. You can see the outline of the old paper on the ceiling and such here. This is my little bro, who is married with a baby now. (I can't believe it!!) I think this is a neat pic as Kevin shovels the old plaster into a bucket you can see the dust rising up. Dirty, dirty work. Not fun to breath. Plaster is down on that half of the room, but lath strips are still up. Can you even tell what a pretty floor that could be? Um~ not now, huh. Heads up! Plaster coming down! YAY! Let the lath removal begin! 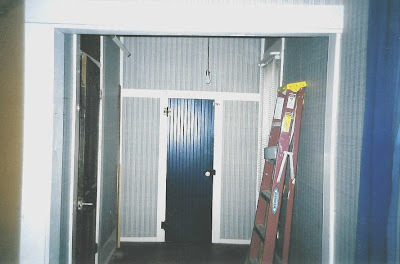 For those of you not familiar with old houses with plaster and lath, you can read about it here. Many people tell us they think it looks like Mark Twain. I guess it *could* be... but that was just the style then. I wonder if it's a self portrait. And most of all I wonder if whomever drew it actually thought that anyone would ever see it again? You can't tell, but the picture is just above the handle of the shovel. 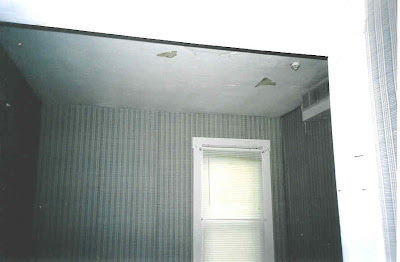 We've since drywalled over it, but when we're ready we plan to cut the drywall out where the picture is. I have a piece of glass to place over it, inside the studs. I can then hang framed art over top and simply remove it when we want to show off our "talking walls". To celebrate our home's centennial in 2007, Kevin made little gift crates using the lath strips from our home, and on the ends I decoupaged this label... only I made it a tinge red and old looking~ (for the life of me I cannot find a pic of the finished product!) You can see the sidewalk picture on that, and I took out our name for safety/blogging purposes. Here are some of the wallpaper layers found in the closet area. Such beautiful paper. Especially the wide border. Oh, how I wish I could find this today! And upon closer inspection I can see that it was pink and green, the same shades I'm using in the room today! We are not finished with this room, (it's been about 4 years). We've just had bigger fish to fry lately. So, it pretty much looks like this now, only with MORE of my *junque* in it. Projects waiting to be brought to life, pictures waiting to be hung, windows waiting to be dressed. We need new windows tho, so I'm holding out! The floor turned out beautifully! You can see more of this room and it's decor to be in this post. I hope you all have enjoyed my 100th post. If you've made it this far, then you you simply must leave a comment! I'll be pulling a winning name from the comments on October 1st. I'm not going to tell you what the gift give away is, but I will tell you that it has something to do with The Scarlett Rose Garden; a garden mix if you will. I do hope that the winner will share their gift on their blog once received! Hi Nikki, I read all the way thru. Love your idea of being able to show the drawing with the glass over it. It does look like Mark Twain. 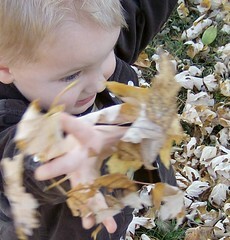 Your home will be beautiful and worth all the hard work. Wow Nikki, I would have been flipping out if I'd found that picture behind the wall! When you moved in, did you find any cool stuff in the attic, or was all the history of the house wiped out from previous owners? There's got to be more on the history of your house somewhere! You've gotta find it! Those are the original wood floors? Gorgeous!!!!! How fun to see the transformation! I like the idea of you being able to pull a bit of the wall away to show off the drawing. It's so cool that you actually have a date for the house! Love those wood floors. And I'd love to be in the giveaway! What a lovely home, I'm so glad it's in good hands. I can't wait to see it all done! That 1907 artwork is too cool and I think that's a perfect idea to cut out the drywall and put the frame over it! Your home must be a dream! So vintagey and warm. What a wonderful house! I'd be a bit daunted by the redo you did since I know nothing about how to do any of it. You are such hard workers and everything looks so beautiful! The "Mark Twain" picture is too cool! I enjoyed all the photos.Its nice to look thru the before and afters to see the tranformations. The house I grew up in wasn't as large as yours and it was only a one story,but it was built in 1924 and my parents worked on it for years like you both have.It was an awesome site to see how much it changed throughout the years. I've been following your home restoration for several years. I can't remember, at the moment, when you came to GI. I've thoroughly enjoyed watching the process/progress. I have a little house, I bought on S. Main, in St Chas. It is made from lath, removed during renovations in the historic district. Love it! WOW! Congrats on the big 1-0-0! You have really put a lot of work into your home- its amazing. I only recently found your blog but I'm avid reader now and wouldn't miss the next 100 posts! I love to see updates on older homes like these. 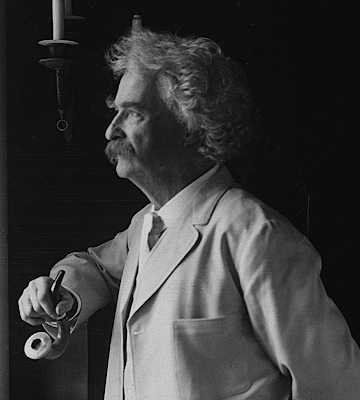 Cool- a Mark Twain-like picture! Our previous owner lived here for 64 years and raised his two boys here. 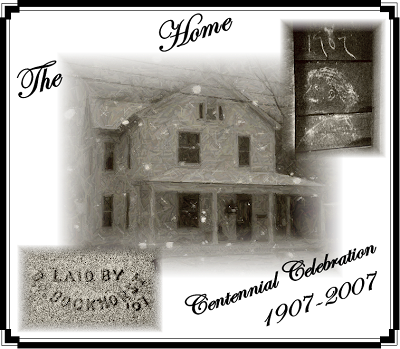 In the basement one of them wrote his name on the cinder block wall. It's so cute, the "S" is backward. We're not removing it. It's part of the history of the house. Congrats on your 100th post!! And your 101 year old house! We had a house in Seattle that was built in 1911. As for pictures - in King County, WA, where we had a home, we discovered that at some point in the 1930s the county photographed every single structure that was on the tax roles. If you had your plat # and lot # you could request a copy of the photo. It was amazing to get a photo of our house in the '30s. Of course, all counties do things differently, but it might be useful to see if your county tax records have anything in their archives. What a great journey! I think all your work is going to be sooooo worth the wait. Your doing everything right. It just takes time. How cool that you found that drawing. You should submit it to The HGTV show...If walls could talk... Do you ever watch that? I'm with you on the blogging thing. I have learned so much from everyone. I love it! Hey Nikki! I love this post and congratulations on your 100th! I think that blogging does take us in so many different directions than we first thought it would. I sure haven't stayed the course on mine. LOL! I never know what I'm gonna say or do. LOL! Oh, girl this post pure brings tears to my eyes...that y'all found the art inside the wall with the date. Priceless, I know.... your idea to cut out the wall and then hang a picture in front of the art, so that you can look at it again and have a conversation piece is a great idea. The room looks so good...I love the wall color and wow, you all worked so hard. Y'all did great! BTW...thanks for dropping by and for all you said! Hope you have a great week! What a great post. I loved seeing pictures of your renovations. Happy 100! I loved reading about this room and finding that art work treasure on the wall. What a fab idea you have to be able to show it off. If only we could travel back in time and get some of that wonderful wallpaper. I can just hearing you saying "Fiddle dee dee!" I love all the old layers of wall paper! They are beautiful! What a LOVED home you have and so many years of days gone by are left in it! The drawing is WONDERFUL!!! 1907, wow! What an amazing home you have. I must admit I'm too big of a wimp to want to renovate a gorgeous old home. But I do so admire the courage it takes to tackle such a huge job. I love the character of old homes and yours is a BEAUTY. Your idea for showing off the wall art is such a great one. How fun will it be to be able to let visitors peek into your walls! Congrats on 100 posts, and I hope for many more. It's been a pleasure getting to know you. Have a great day, Nikki! Ooh how fun! I love old house and all the stories that are hiden inside. That drawing is so cool. Just think...someone stood there over a hundred years ago and drew that. Then it was covered up and no one saw it until you guys found it. I wonder what other hidden gems are in that house. What wonderful history. I would love to live there. Thanks for showing your house to us. Oh and congrats on your 100th post. Hope you have many many more. Congratulation on your home and your 100th post. Wow you have had your hands full too. Thanks for the tips as well. I agree with you on the curtains. But you can't tell that to a man after he struggled to drill through the hard wood. It broke his drill bit, stripped the screws and once it was up after that I decided to leave well enough alone. Thank you so much for stopping by and entering my giveaway! And Congrats on your 100th post!! Please enter me in your giveaway. Excellent post on your room makeover. The first house we owned was a house built in 1907 in Columbus! There's so much heart and soul that goes into an old house. You have done a great job!! 100th post. Your house is really coming along. It takes a lot of patience to totally renovate a home like you are doing. I'm so glad I noticed your comment on another blog...that is how I found you. I have really enjoyed your blog and look forward to updates. Congrats on your 100th post!!!! Nikki! Thanks for the tour and sharing your home with us. I love old homes and the history within their walls. Happy 100th post to you. Well, I would love to be apart of yours, and hope you will take a moment and come by my blog and sign up for mine!! All the hard work you guys are putting into this will be so worth it. I can already tell it is a "SHOWPLACE". I enjoyed your post even if I was late getting to it. I adore old houses. Mine is not anywhere as old-early 40's but it is a mystery. It is only 750 sq feet but it used to be smaller! Congrats on your 100th post! I have not made it to 20 yet. Hey Nikki! Come by when you get the chance for some tagging fun...you have been tagged by me! Have a great day! Very cool! That is my favorite show on HGTV!!! And you get to live it!!!! I really like your blog a lot! I love the pink-ish wallpaper you discovered as well. That drawing you discovered could really be Mark Twain, who knows!! Hugs from the Netherlands, and I would like to enter your give away. Congrats on your 100th post! I have an old house too, built in 1921, in Tacoma, WA with a built in china hutch and window seats. I love many things about it, but would love to modernize a few things too! Enjoyed finding your blog! Loved reading about your house. Mine is 200 years old, the newest addition was added in 1842. Unfortunately, most of the history had been removed by previous owners. Our one great find was a fireplace behind a wall, but the chimney has been cut off at the second floor. It's still gorgeous, though. Took our total of fireplaces to 6! I hope you'll be able to stop by for a visit! It's nice making new friends. Such a lot of work! Will you contact If Walls Could Talk about that drawing? Wow! What a find! Congratulations on your 100th post. I would love to win your secret surprise!! Your old home is great. I used to always think I would love to redo an old home but we did help some friends with theirs. It is a lot of work but so worth it. Theirs is beautiful as yours will be. Congratulations on your posts. I would love to be entered. Congrats and thank you for sharing your find! It's like he stepped right thru time. By the way, I'm sure you know this but do a search on e - bay for vintage wallpaper, there is a lot of it out there! Just loved the tour of your home...we have an oldie, too, with plaster walls... one of the bedrooms had 9 layers of wallpaper... ewwwww LOL ... it is a never ending job and alot of maintenance! Happy 100th post!!! I can't wait to see the results on all your hard work in this wonderful house- we have an oldie too that we just moved into a year ago and are slowly making progress- if only the dough would roll it it would go much faster!!! Oh man you are one brave lady to have been able to go through al of this renovation like this. I bet your young. I never would have been able to do this.. Good continuation.. Great idea for the picture in the wall. Great job restoring an old gem. I admire your courage and strong will to see this project through. Heres my post for the giveaway on Aug 5th 2009. This has always been my favorite post.I love old homes and seeing them in the middle of progress and seeing the after.